more than $500,000,000.00 on behalf of the injured. After 29 years as a defense lawyer for hospitals and physicians, our Founding Attorney, Marshall Silberberg, decided to put his knowledge and experience to use for the “right” side – for those who had been injured and victimized by the negligence of others. The strength of the firm lies in this unique experience and perspective. All of our lawyers are prior defense attorneys who know how the opposition works. With this knowledge and the high level of personal attention devoted to each case, the Law Office of Marshall Silberberg has achieved great success. Since the beginning, our goal has been to bring a degree of peace to those who have been severely injured. To date, we have recovered more than $500 million on behalf of our clients. Due to our previous defense experience, we have cultivated relationships with an array of physicians and other experts who provide invaluable assistance in the crafting of these cases. Ultimately, we strive to put our clients in a position where they are able to care for their loved ones for the rest of their lives. Marshall Silberberg is a very BUSY Attorney! Always working behind the scenes! Now saying that, HE turned my case around and resolved it in a reasonable timeframe! I give him 5 STARS hands down! 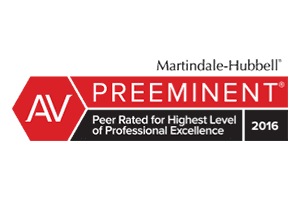 Martindale-Hubbell® Peer Review Ratings™ are recognized as the gold standard in lawyer ratings, providing consumers with access to reviews and ratings that will help them find the right lawyer for their legal needs. 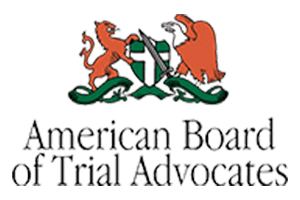 Members of the American Board of Trial Advocates are held to the highest standards of integrity, honor, and courtesy, and are expected to elevate these standards throughout the legal profession. Recognized as the most reliable and unbiased legal resource for attorney referrals anywhere in the world, the Best Lawyers® title symbolizes excellence in practice. No more than 500 active trial lawyers are admitted to the International Academy of Trial Lawyers at one time. Considered to be the most prestigious organization of trial lawyers in the world, members are considered to be elite. The patented Super Lawyers® selection process is an extensive, multiphase process involving peer nominations, evaluation, and independent research. Selection is limited to only the top 5% of lawyers in a given state. At the Law Office of Marshall Silberberg, we are dedicated to fighting for the compensation our clients deserve. Before founding the Law Office of Marshall Silberberg, Attorney Silberberg served for 29 years as a defense attorney for hospitals and physicians. Attorney Kimberly Carasso has been practicing law for nearly two decades. Always a driven personality, she pursued a medical career before discovering her passion for law. William takes a serious approach to both relating to clients and handling His work. He relys on strong organization and time management skills in order to accomplish all client needs from a litigation standpoint. Our firm fights for victims of negligence in many types of personal injury cases, including car accidents. Our personal injury lawyers in Orange County have also earned a reputation for our success in medical malpractice cases. We devote tremendous amounts of time and energy to helping our clients obtain the best chance possible at maximum compensation.Our goal is to bring a degree of peace to the severely injured. We aim to secure compensation for clients and their loved ones that will take care of them in the present and the future. Victims eligible for compensation may recover damages for medical expenses, lost wages, pain and suffering, loss of consortium, and more. Many firms take the same approach to cases – they meet with experts, develop strategies, map out a winning game plan, and aggressively advocate for their clients. What differentiates the Law Office of Marshall Silberberg from just any other firm is our tenacity and work ethic. Attorney Silberberg has tried an excess of 200 medical malpractice cases to verdict. Defense insurance carriers know that he, and the rest of our firm, will not hesitate to try a case. Begin a Free Case Evaluation with a Personal Injury Lawyer in Orange County. Attorney Marshall Silberberg was an insurance defense lawyer prior to opening his own firm in order to serve injured people across Southern California. This experience allows him rare insight into the insurance industry and the way insurance lawyers prepare cases. This perspective, a skilled and dedicated legal team, caring, attentive client service and access to a network of other resources have won meaningful results and helped injured accident clients overcome serious hardships and find their new "normal." Our firm operates on contingency fees, meaning we will absorb your attorney fees if we do not obtain recovery on your behalf. Contact the Law Office of Marshall Silberberg today to learn more about your legal options! What is Considered Wrongful Death in Nursing Homes?